Station Hollywood: Composer Chitragupt had memorable combination with Rafisahab. Composer Chitragupt had memorable combination with Rafisahab. Chitragupt’s memorable combination with Rafisahab. Chitragupt gave very melodious tunes in the 50s and 60s and as most of his songs were sung by legend of legends Rafisahab, the songs became immortal after creation. Just because the world of music in 1960s was dominated by giants like Naushad Ali, Shankar Jaikishan, Roshanlal Nagrath, Madanmohan Kohli, less known composers like Chitragupt did not receive the recognition he derserved. Rafi’s song “chal ur ja re panchi” composed by Chitragupt in the film Bhabi in 1957 brought tears in the years of numerous viewers. Rafi used his emotions towards fulfillment of the literary value of the song and Balraj Sahani’s lips in the song also require special mention. In the same film “chali chali re patang” sung by Rafisahab and picturized on Jagdeep was require mention. Chitragupt Srivastav, better known as Chitragupt, was born in Karmaini, Bihar in 1917, and due to his experience in the hindu heartland most of his tunes had the fragrance of folk songs. Besides as he was a lecturer in Patna, his academic brilliance did blend with his musical excellence which was given expression by Rafi. Rafi’s song “chaand jane kahan kho gaya” in the film Mai chup Rahungi, composed by Chitragupt, written by Rajinder Kishan, and picturised on Sunil Dutt and Meena Kumari showed the use of light music as well from Chitragupt. Lata Mangeshkar sang the duet song with Rafi. The other hit duet in the film included “koi bata de dil hai kahan” sung by Rafi and Lata in the film. Rafi’s song “itni nazuk na bano” in the film Vaasna composed by Chitragupt created a very romantic appeal. The song of Rafisahab “aaj ek darja pila do” in somber mood flabbergasted the audience. It was picturized on Raj Kumar and used in the film Vaasna. Also Rafi’s song “yeh parbaton ke dayre” became a big hit in the late 60s. Besides Chitragupt gained attention in the late 1950s with the songs of Rafi “chupakar meri aankhon ko” and “chali chali re patang” in the film Bhabhi which were very impressive. Chitragupt’s compositions in somber mood for Rafi had a great impact. One example is “mujhe dard-e-dil ka pata na tha” from the film Akash Deep in 1965. It was picturized on Dharmender. In Sunil Dutt’s film Nartaki, Chitragupt Rafi combination provided the song “zindagi ke safar me akele the hum”, which became hit. The song “raste me hai tere kab se khare” sung by Rafi and Lata in the film Opera House require special mention. 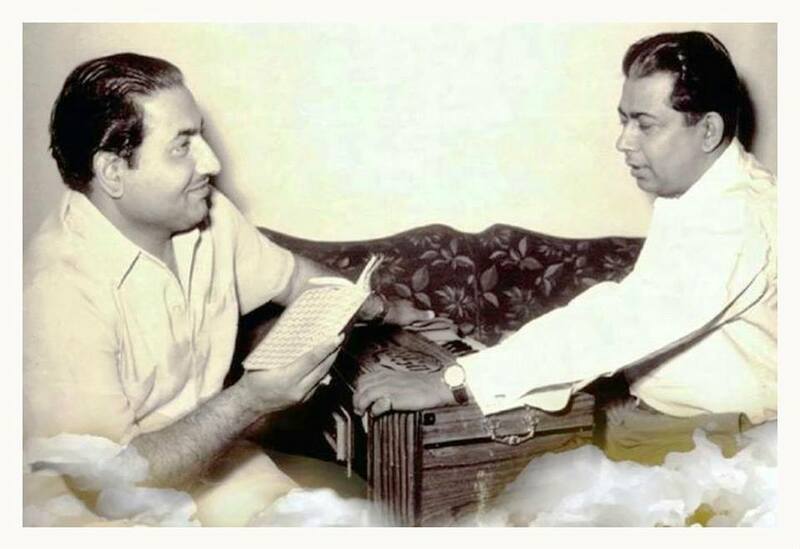 In Jeetender’s film Aulad, Chitragupt and Rafi combination produced timeless romantic song “aabke bahar ayi hai tere hi naam ke”, and “aarman tha hume jinka” which became super hit. In Feroz Khan’s film Oonche Log, Rafi’s song “jag dil-e diwana” became super hit. It was very romantic. There was hit song in the film Pyar Ka Sapna titled “ae meri zindagi” sung by Mohammad Rafi. There were other hit songs of Rafi for Chitragupt including “yeh mana ji dil se” in the film Zimbo, “chand kitne door tha” in the film Afsaana, “itni badi duniya” in the film Toofan Me Pyar Kahan, “o duniya ke malik” in the film Shiv Bhakt, “ek baat hai kehne ki” in the film Samson, “mujhe apne sharan me” in the film Tulsidas, “aap moujud yahan” in the film Baaghi, etc. Although Chitragupt gave landmark music in films like Oonche Log, Ganga Ki Lehre, Zabak, Bada Aadmi, etc., he did not get recognition during the golden age due to dominance of Shankar Jaikishan, Naushad, Roshan and others, and may be due to his composition of music in less significant films. He hardly got an opportunity to compose music in big banners like RK or Guru Dutt, otherwise his contribution was very grand during the golden age. Happy birthday to patriotic star Manoj Kumar. Happy birthday to dancing star Jeetender. Happy birthday to Rakhee Gulzar. Happy birthday to Neha Dhupia. Happy birthday to dancing star Sri Devi.